Now in its third year, program making big impact on fight against breast cancer. (Toledo, Ohio, October 30, 2013): AccuShred, an information destruction and electronics recycling company headquartered in Toledo, has announced that its “Shred Cancer” program has raised over $35,000 for Northwest Ohio Affiliate Susan G. Komen for the Cure since its launch in August of 2011. 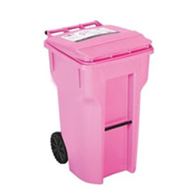 Shred Cancer is an innovative awareness and fundraising program that encourages AccuShred customers to display and use the company’s secure Pink Shred Bins for holding their sensitive information to be destroyed, and to make a donation for each bin AccuShred services. When they do so, AccuShred matches the customer’s contribution, with 100% of the money going to Northwest Ohio Affiliate Susan G. Komen for the Cure to support local breast health programs and research. 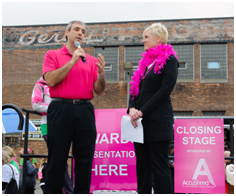 At the recent Komen Race for the Cure, held September 29, 2013 in Toledo, Segall joined event emcee Chrys Peterson onstage to announce award winners and mention future plans for the program. “We really want to get more customers to participate in Shred Cancer and expand it to other parts of our service region,” he said. In addition to Northwest Ohio, the company serves customers throughout Southeast Michigan, particularly throughout Detroit and the Ann-Arbor-to-Lansing corridor.